Jack Barsky's life has been improbable, impossible and downright fascinating. In fact, CBS 60 Minutes found it so interesting that they featured the story in a double segment which was repeated twice. This true spy story had a very humble beginning in the most backward corner of the old East Germany. Smarts and hard work got Jack out into the world, where he started a career teaching chemistry and math at a well-known university. And then his life took a fantastic detour – Jack was recruited by the KGB and infiltrated into the US where he spent ten years spying for the Soviet Union. He "resigned" from the KGB and was eventually discovered by the FBI. Today, Jack is a law abiding patriotic American citizen who is taking advantage of one last chance to live a normal life. This is a story of a life that parallels the rise and fall of Communism in the second half of the 20th century. but in its broader sense it is a multi-layered human drama played out against the background of a historic clash of systems and ideologies. Fittingly, Steve Kroft of CBS's 60 Minutes, called Jack a "relic of the Cold War." Indeed, he is a relic, but this this relic is very much alive, and he is now sharing his story, a story with all the elements of a Shakespearean drama: ambition, courage, ruthlessness, deceit, betrayal, love, survival and redemption. It is a story Jack has laid out at length in his book "Deep Undercover". 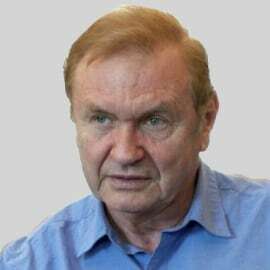 In his endorsement, Joel Fields, Executive Producer of the successful show "The Americans", states: "Jack Barsky's ultimate act of courage is sharing this intimate story that sheds light on the true personal consequences of a life in espionage. Gripping and emotional, Deep Undercover peers beyond the Iron Curtain for a look into the world of a KGB officer illegally living abroad". Jack is now to taking his story and his vast experience on both sides of the iron curtain to live audiences. Get ready for a breathtaking ride through the Cold War and the murky world of undercover existence; get ready to hear how one man was able to overcome this shady past. Jack's delivery style is authentic and peppered with self-deprecating humor. You will be entertained, educated, fascinated, baffled, and moved.